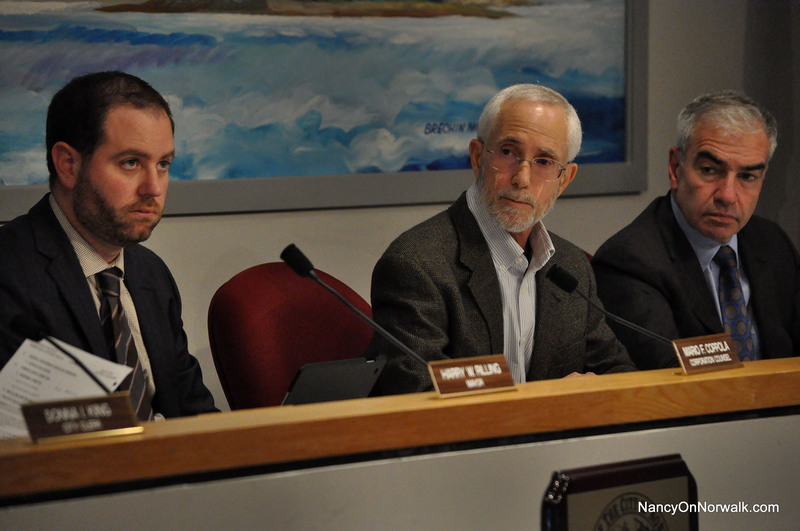 From left, Norwalk Corporation Counsel Mario Coppola, Common Council President Bruce Kimmel (D-At Large) and Councilman Michael Corsello (D-At Large), during Tuesday’s Council meeting. NORWALK, Conn. — Ringing endorsements heralded the Common Council’s unanimous approval Tuesday of two major components of The SoNo Collection’s design that is now before the Zoning Commission. 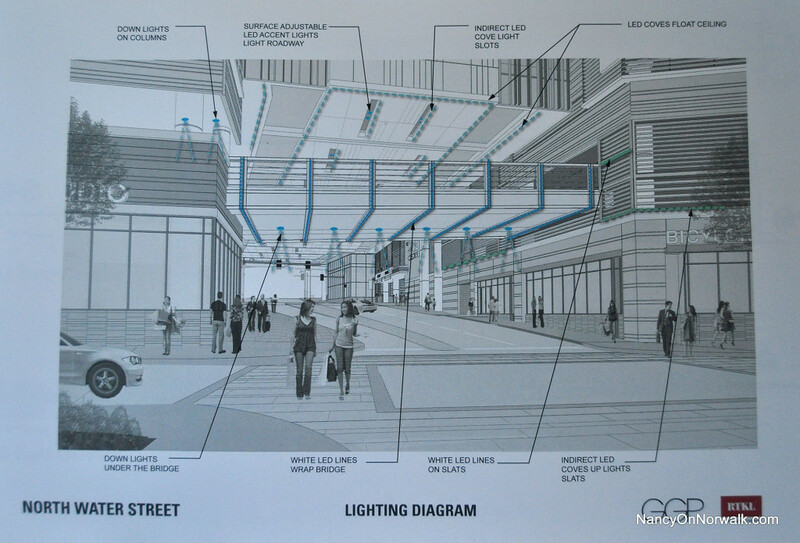 The Council, in a brief discussion, gave its nod to the plans for the North Water Street underpass – formerly but not formally referred to as the “tunnel” – a design worked out by General Growth Properties (GGP) and The Cecil Group, as well as GGP’s plans for public realm space in the mall planned for West Avenue at the intersection of Interstate 95. The public realm plans are “amazing,” Mayor Harry Rilling said. “They are going to make this not only a shopping experience, it’s going to be an experience that people can walk through. 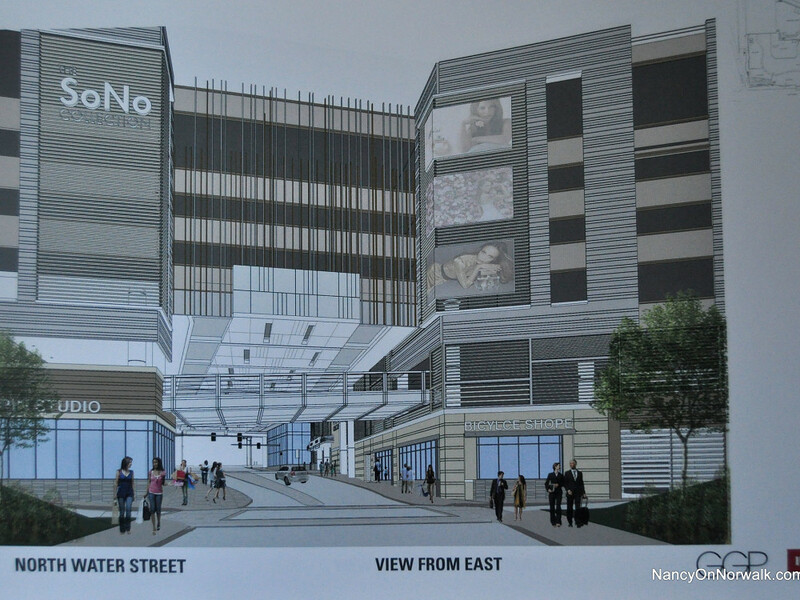 I don’t know of any project anywhere that I have seen with the public realm areas that will be this interesting, this attracting to people, getting people to come into the mall,” Rilling said. GGP’s plans include an indoor sculpture garden on its northwest corner, next to the I-95 on-ramp, outdoor plazas, a green wall and a rooftop plaza with a view of Long Island Sound. “They have gone above and beyond, they did a lot of concessions, they have added a lot to this project,” Planning Committee Chairman John Kydes (D-District C) said, adding that the rooftop plaza was entirely GGP’s idea. Kydes also said he was very happy with the underpass. The work with GGP began with Saturday morning meetings last winter – 2014-15 – with a joint Redevelopment Agency/Council Planning Committee/Planning Commission work group, to work out changes to the Land Disposition Agreement for the property. Once that was done, RDA and the Council insisted on more work, with the help of Cecil, a consultant hired by RDA. “This is far better,” said Doug Hempstead (R-At Large), who had led the Planning Committee when the proposal came in. Much better, but, “The only part I was disappointed, thought there was some opportunity to move it forward, they didn’t do some imagineering, i.e. Disney-type things, to work more with the ceiling,” Hempstead said. That was discussed at last week’s Planning Committee meeting, where Hempstead said he thought LED lighting might have been used more creatively. “Basically, even though I know there’s different levels, there’s a white on white on white and maybe I thought there was an opportunity to really make that tunnel blend in with that environment as a whole. Hopefully in the future they can work on that,” Hempstead said Tuesday. GGP is hosting a town hall meeting at 6:30 p.m. Wednesday in the City Hall Community Room. The application will be the topic of a Zoning Commission special meeting April 27. A public hearing is expected in May. asking how the SoNo Collection can be integrated into these two neighborhood areas?? Seems like a fine idea…living in Daylight Energy, “empty canyons after hours invite trouble,” Norwalk has unique history lessons. Why not capitalize on these neighborhoods? ?